The i386-Drive (ID) is a compact, low-cost, high performance controller based on the 33 MHz, 32-bit Intel 386EX It combines the powerful i386EX CPU and numerous peripherals on a single PCB measuring 4.7 by 4.5 inches. It can be used in numerous industrial or data acquisition applications. The ID supports up to 512 KB 8-bit SRAM, 512 KB 8-bit Flash, 1 MB 16-bit SRAM, and 1 MB 16-bit Flash. A 512-byte serial EEPROM, which does not require a battery backup, can be used as an additional memory device to store important data. An optional real-time clock (RTC) provides information on the year, month, date, hour, minute, second, 1/64 second. A lithium coin battery can be installed to back up both the SRAM and RTC. Two asynchronous serial ports from the i386EX support reliable DMA-driven serial communication at up to 115,200 baud with RS-232 drivers. The i386EX also offers one synchronous serial port. An optional UART SCC2691 and a dual UART SCC2692 can be added for an additional three asynchronous serial ports with RS-232 or RS-485 drivers. Three PC-compatible 16-bit programmable timers/counters can generate interrupts or count external events, at a rate of up to 8 MHz, or can generate pulse outputs. 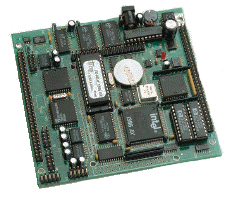 Three 8-bit, multifunctional, user-programmable I/O ports are included in the i386EX. Four external interrupts are buffered by Schmitt-trigger inverters and provide active low inputs. A supervisor chip (LTC691) with a watchdog timer is on-board. Two PPI chips (82C55) provide 48 user-programmable I/O lines totally free for application use. The optional SCC2692 UART provides 15 additional I/O lines. In “power-off” mode, the ID consumes very low (uA) power. Users can turn off the switching regulator via software, and use the RTC or an external signal to turn it on.